The great guitar boom started slowly in 64 but, arguably, peaked in 67. You can thank the British Invasion (and all that followed) for that. By 67, it seemed that most teenage boys wanted to be a guitar player (me included, I was 15 in 67). That meant a lot of guitar sales. And 335’s were only the tip of the iceberg as they were generally too expensive for teenaged players. 335/345/355’s went from sales of around 2000 in 1964 to 3300 in 1966 to 8300 in 1967. But when you add in the number of Melody Makers, SG’s, Firebirds and acoustics (folk rock was huge by then), keeping up with the demand must have been more than daunting for the folks at Gibson. I don’t have accurate totals for all of the models but if 335’s are any indication, the increases were massive. Gibson probably added workers and shifts but they also had to work faster and more efficiently and that usually means a few things…like diminished quality, higher prices and changes. The good news is that the quality, while perhaps diminished somewhat is still very good. I don’t see nearly as many 67’s as I do early 335’s but those I have seen show overall good work. The glue is a little sloppier on the inside, the fit and finish can be inconsistent but the guitars still play well and sound good. I can’t speak for the lower line models like the Melody Maker because I rarely see them. I can tell you the high end stuff (L-5 CES, Johnny Smith et al) was still built to a very high standard judging from the few I’ve played. So, what changed in 67 on the 335? The nut width was still the very slim 1 9/16″ but the depth seems to have increased again after having gotten extremely thin in 66. Most 67’s I’ve played are pretty deep at the first fret and show a fair amount of increase to the 12th. More like a 64 with a narrow nut. While the conventional wisdom says 67’s had t-top pickups, I find that to be misleading. There are certainly 67’s with t-tops but most of the ones I’ve inspected have pre T top patents with the poly coated windings. Fingerboards were all Indian rosewood by 67 although I’m sure a few pieces of Brazilian are out there. The knobs went from reflectors to “witch hats” in late 66 and the pickguard bevel went from wide to narrow at around the same time. 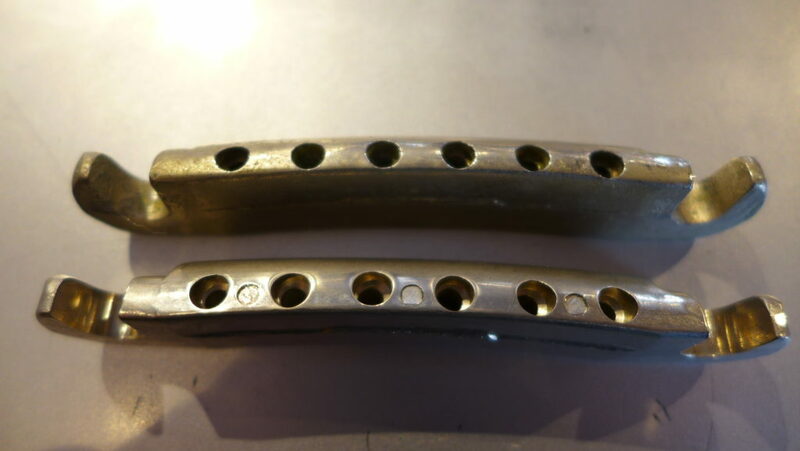 The hardware was chrome by 67 except for the occasional pickguard bracket (they must have had a lot of nickel ones on hand). The tuners never went to chrome. The cutaway shape was changed a bit as well and I have a theory about that. Some of the 67’s look exactly like a 64-66…pointy ears as you would expect. But some of them (especially Trinis) have these short stubby ears some call “fox ears”. I’ll wager a guess that they needed additional forms to keep up with the demand and made some new ones at some point in 67. It’s subtle but not that subtle. It’s interesting that the shape would change again in 68. The important point here is that most of the changes were cosmetic and perhaps reflected decreased costs-Indian rosewood was cheaper and the narrow bevel guard probably saved some pennies. How does a 67 sound in relation to, say, a 64? Not so far off, in my opinion. 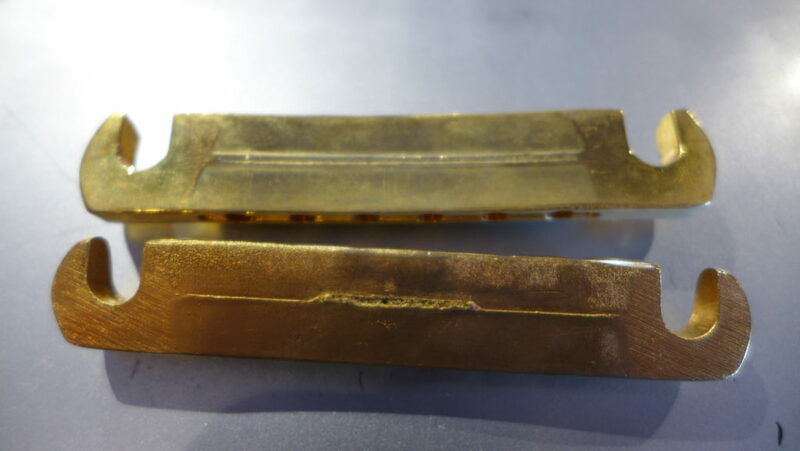 The poly wound pre T tops can be a little bright compared to the enamel coat wound 64 patents. The trapeze tailpiece can affect sustain a bit (but not as much as you think). They are also very consistent probably because the winders (so I’m told) had a stop function when they hit 5000 turns or so. That doesn’t eliminate all variation but it would eliminate some of it. In 64 and earlier, the workers doing the winding just filled the bobbins by eye. You can argue with me that a Brazilian board sounds better than an Indian board but I’ll tell you that you are delusional. A Brazilian might look better but I’m not buying the tone argument. 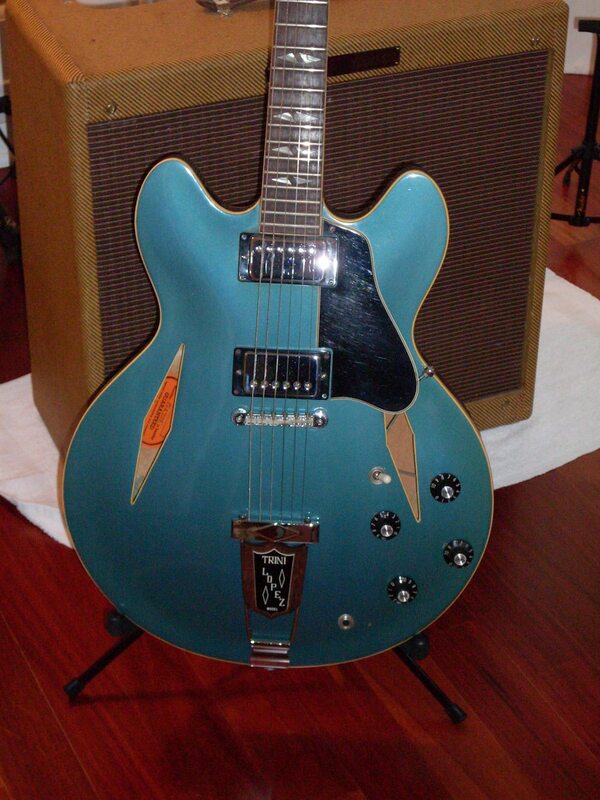 If I put a 67 up against a brand new high end Memphis built 335, I’ll still take the 67 for tone. Call it old wood, call it mojo or call it snobbery. The new one will probably be a little easier to play with the wider nut and maybe look a little better in the fit and finish but I think the 67 is going to smoke it when it comes to your ears. Finally, a 67 can be had for as little as $3500 if you’re lucky. I see them priced as high as $8000 or even a little more but I think the sellers are dreaming as they so often do. Check the neck for twists or back bow before you buy. 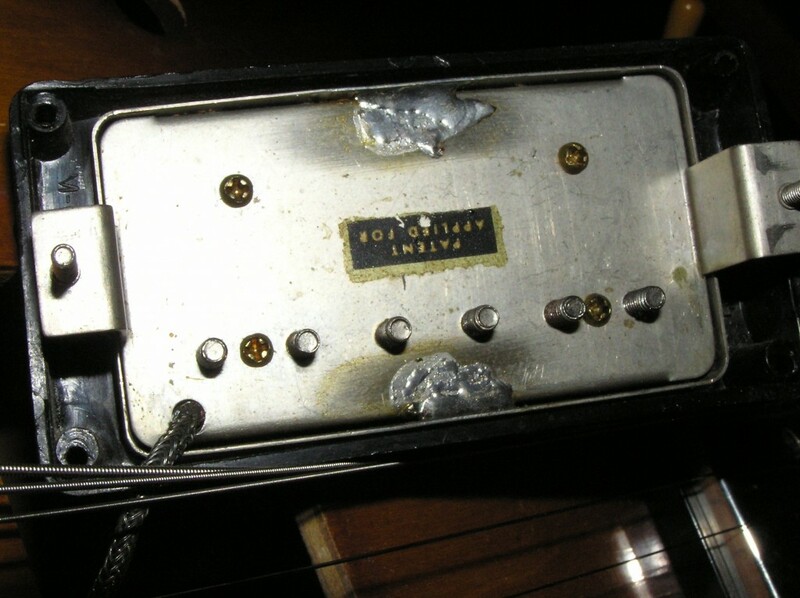 67’s are no more likely to have neck problems than any other year but it’s something you should check on any guitar new or vintage. OK, its a Trini but lots of 335’s have the same shape “ears”. Compare these to the 67 at the top of this post. These are shorter, pointier and at a wider angle from the neck. Some call them “fox” ears. These are only found in 67-maybe very late 66 and very early 68 but, for the most part, it’s a 67 thing. 1980 ES Artist. Good points and bad points abound. Good points? 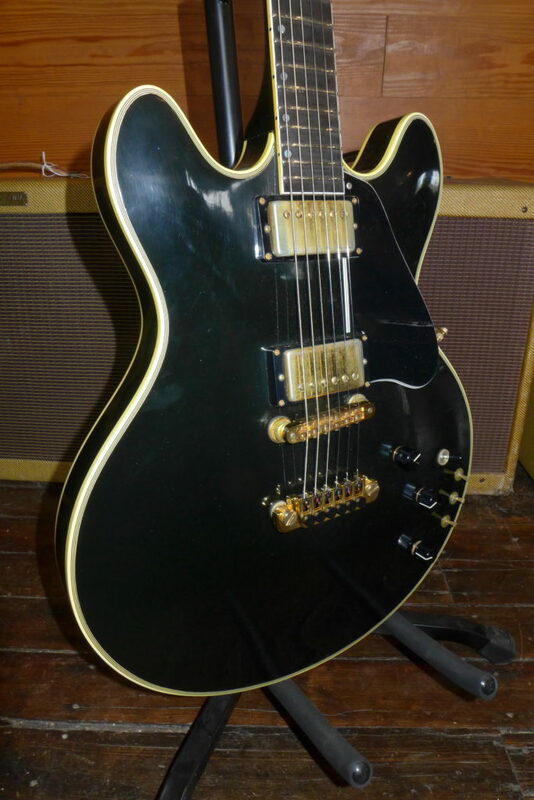 It’s black and the neck is pretty nice. Bad? Read on. I don’t do re-runs (OK, I posted the Christmas poem twice but I warned you) but this one is different. 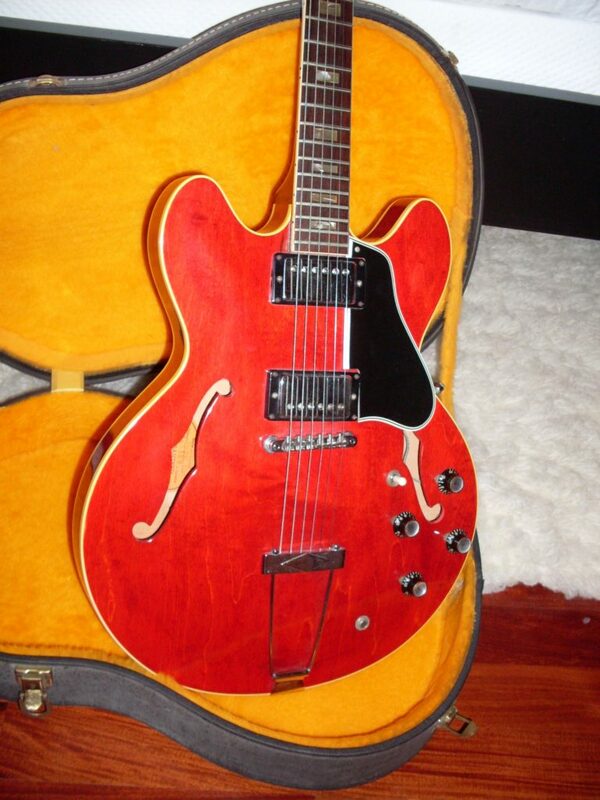 I wrote about the much maligned ES Artist a while back but I had never owned one and had never played one plugged in. So, in that post, I could only wax theoretical about active electronics and on board gimmickry. But now I own one and I’ve had my electronics tech go through it and make sure everything was working right. It needed a few capacitors changed and some general maintenance but I’m pretty sure it sounds like it was meant to back in the day. In order to not bury the lede, I have to say right off the bat that this thing sounds pretty god awful with the active electronics engaged. I don’t recall ever hearing sounds like the Artist puts out-even in the 80’s which, in my memory, were a bit of a cultural wasteland. C’mon, the biggest hit of the Summer of 82 was “Don’t You Want Me Baby” by the (where are they now) Human League. Synth pop. Wasteland indeed. And they were nominated for best new artist at the ’83 Grammys fortunately losing to the much more talented Men at Work whom I kind of liked. Anyway, it’s the late 70’s and Gibson/Norlin is trying to be innovative by hiring on Robert Moog (Dr. Bob) to design a circuit for their new “Artist” series. Actually, Norlin owned Moog at the time and it was probably more like they drafted him. The RD Artist was first and flopped pretty badly. Then came the Les Paul and ES Artists which did much better but can’t exactly be called a rousing success. The line died a quiet death in 1985. So lets listen to this thing. So, with no on board effects engaged, the guitar sounds like a slightly strident 335. The active tone controls which have a center detente and are boost and cut controls work pretty well. The one I have doesn’t have the detents going up or down-just in the flat or middle position. Apparently some had 5 detents in both directions. Different concept from the usual tone controls but perfectly functional once you get used to them. Then we get to the three on board effects. There is a compressor, an expander-whatever that is and a treble boost. In general, they are way too strident and artificial sounding. The compressor is the best of the effects but you have to dial it back using the little pot inside the control cavity. Dimed, it’s a horror. Sounds like cats being tortured. The expander has a level control and a delay control inside there and that too needs to be tamed a bit to have any use at all. I couldn’t figure out exactly what the delay pot did. The level pot turned up made a kind of swirly, trebly slightly atonal mess that was worse than cats being tortured. Turn it down and you have the cats being tortured with a blanket thrown over them. The treble boost did just that but the guitar is plenty bright without it and it just gets overly glassy. Sorry, Dr. Bob, this is not your best work. 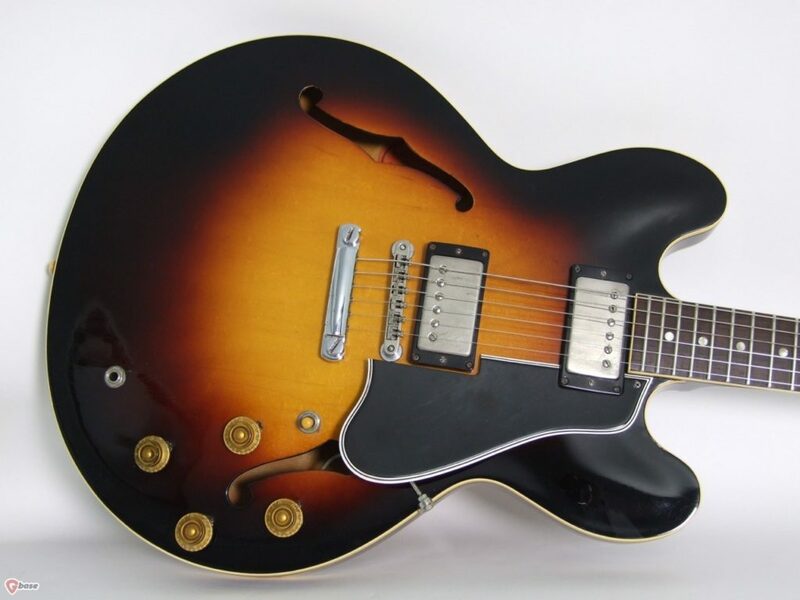 The guitar in normal mode is pretty much like a normal 70’s 335 with active tone controls. The neck profile is OK. 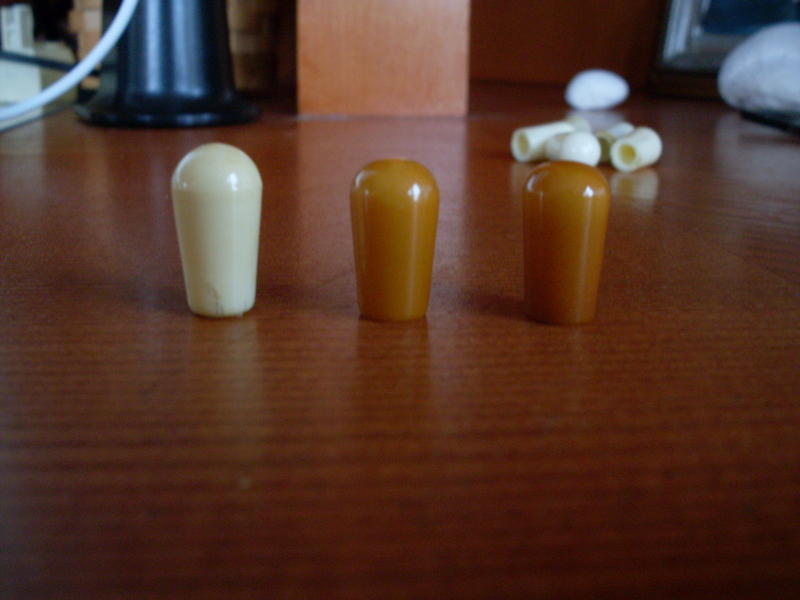 The nut is 1 11/16″ and the neck has some meat to it. The pickups are, I believe, Shaws which sometimes need a little treble boost (but not these). Output seems a little low but tone wise, you can get some decent music out of it. Just don’t touch the miniswitches. ES-Artists are relatively cheap and you can ignore the effects and have a decent guitar. Or you can use the effects and scare small animals and children. My Artist is a 1980 and it’s factory black. And yes, you can buy it from me for cheap. This is the heart of the Artist. 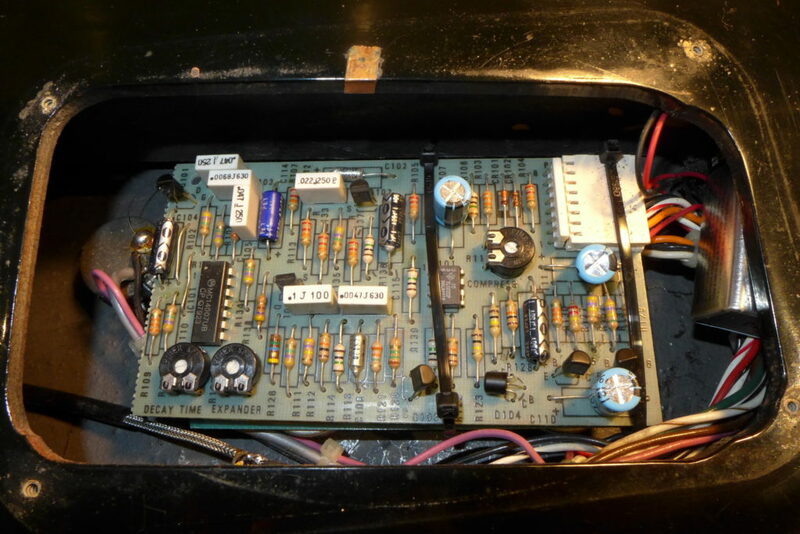 A couple of stacked circuit boards with three little mini pots to control the amount of animal torture you want to add to your 335 tone. Takes a 9V battery and a lot of getting used to. Here’s a pair of gorgeous near mint 62’s. The red they used in 62 isn’t the one that fades to watermelon. If the guitar has been kept out of the sun, the red is stunning. Leave it in the sun and it will go brown. PAFs all around. The nickel looks like chrome it’s so shiny. Every year 335 seems to have its followers. Some (like me) love the 58 with its thin top and shallow neck angle. The 59 has the big neck aficionados (even though at least half the 59’s don’t have big necks). 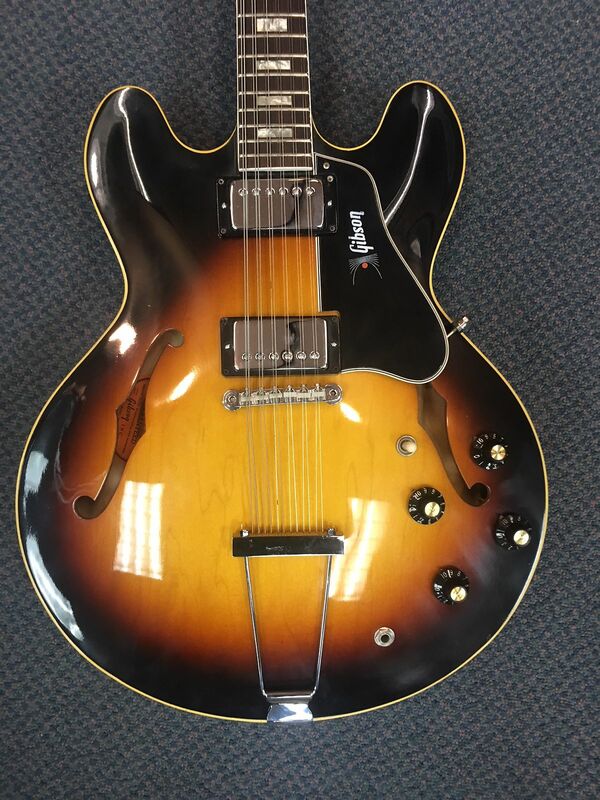 The 60 has that great medium neck for at least half the year and still has long magnet PAFs. The 61 is the bargain dot neck for those who can spend big but can’t spend huge. Late 63 and 64 have tons of followers due, in part to the Clapton connection and, in larger part, to that great neck profile. That leaves the 62 which sometimes gets treated like the red headed stepchild. Look it up. I think the 62 simply gets lost in the shuffle. The neck is generally not chunky nor is it as thin as a 61. Sometimes it has PAFs and sometimes not. Or one of each. Mostly, it’s a block neck but sometimes it’s a dot. No wonder it has something of an identity crisis. There’s a lot to like about a 62. First, the later PAFs seem to be remarkably consistent. There’s hardly a bad one to be had. While early PAFs can be magical or marginal, a late PAF is almost always excellent. Early patents are the same pickup with a different sticker. The build quality is a good as any other year and better than any year that followed. The neck profile is fairly consistent-usually around 82″-.83″ at the first fret and around .90″ at the 12th. That’s bigger than a 61 but smaller than a 64. But it’s a sweet spot for a lot of player-particularly the who have always played Fenders or those with relatively small hands. The baseball bat is not for everyone despite how it gets talked up on all the guitar forums. What really strikes me about a 62 is that it costs about the same as a 63 or 64. Yes, PAFs and patents are the same through 64 but you really would rather have the PAFs wouldn’t you? I would. They are a big part of the vintage mystique. Don’t get me wrong, I love the 64 neck-I played one for years before I could afford a 58. But I keep getting 62’s and they keep impressing me. I think that maybe they got better mahogany during 62 than they got previously. 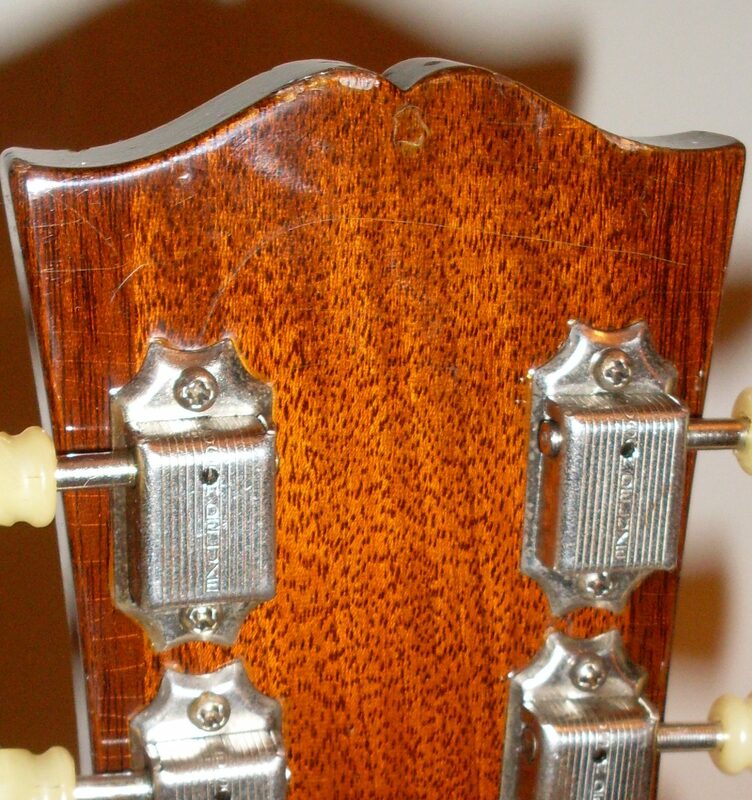 61’s are very prone to neck problems due certainly to the very thin neck profile but maybe, just maybe, the mahogany wasn’t so good either and Gibson decided that too many guitars were coming back with problems. 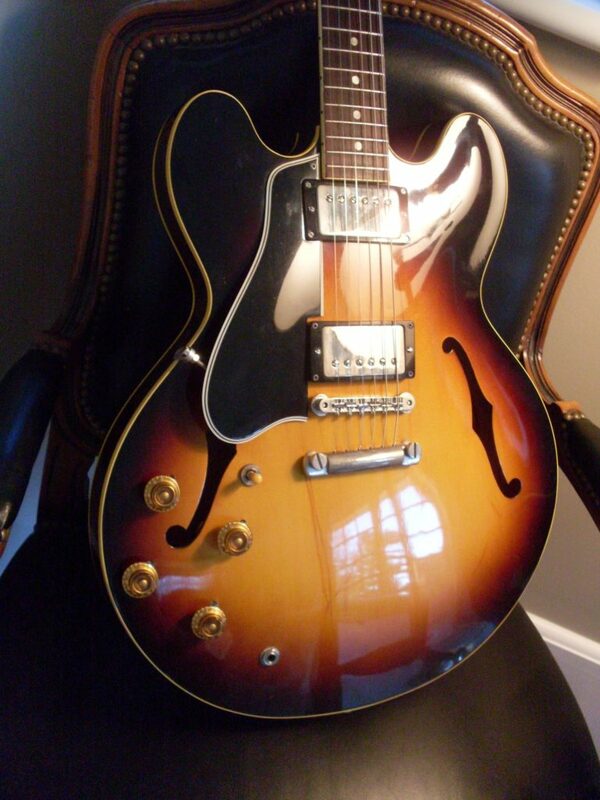 I’ve had at least a half dozen 61’s with neck issues (I don’t buy a lot of 61’s for that reason). I don’t think I’ve ever had a bad neck on a 62. 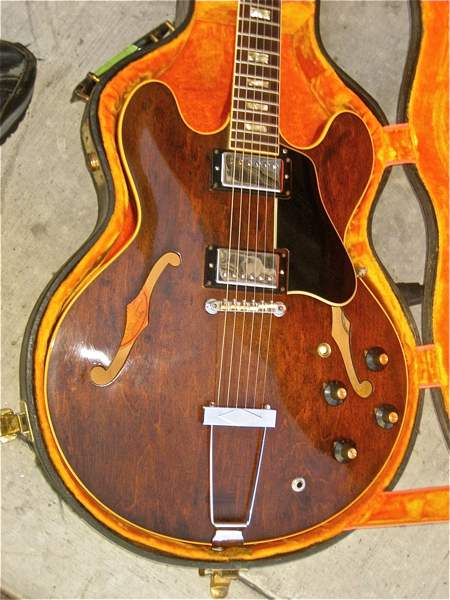 The 335 was still a relatively low volume seller for Gibson in 1962. It wasn’t until 64 that the numbers started get to the point where the workers were playing catchup to the demand and quality sometimes suffered. In 61 they made 886 335’s. In 62 they made 876. By 65, that number doubled and by 67, it was up more than fourfold. Given that all the other models ramped up production during this “guitar boom”, it’s no surprise that quality began to diminish. That’s not to denigrate a 67 335-it’s still an excellent guitar but there are qc issues that occur with more frequency during these “boom” years than they did from 58-64. It’s not for nothing that these are called “the golden years” at Gibson. One final point-I keep an informal “ten best” list of the 3×5’s I’ve owned. It changes a lot but for the past five years, there has been a 62 on that list. It was a refinished dot neck 62 but still, a 62. The “average” 62 is a great guitar. I don’t know why it keeps surprising me that 62’s are so consistently good. Everything was going right for these guitars and Gibson had finally ironed out the few bugs that existed (shaved bridges (58), output jacks ripping out of thin top (58), deteriorating tuner tips (59/60), warping, twisting necks and truss rod issues (61). 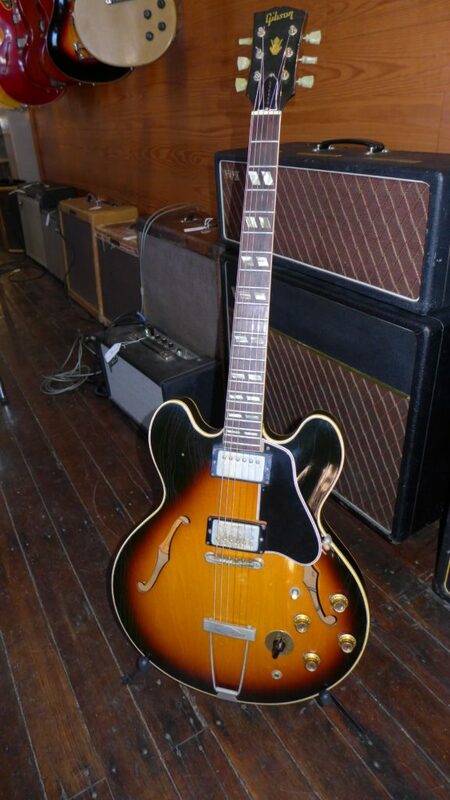 I think, as long as they remain well priced, the 62 will be a guitar that I seek out. I love 58’s and 59’s but sellers have gotten totally out of control with asking prices. Right now, 62’s are a sweet spot. Here’s a 62 dot neck that’s been played hard and has taken on a bit of a brown cast. Not as pretty as the bright red but still a great player. And it’s a dot neck. 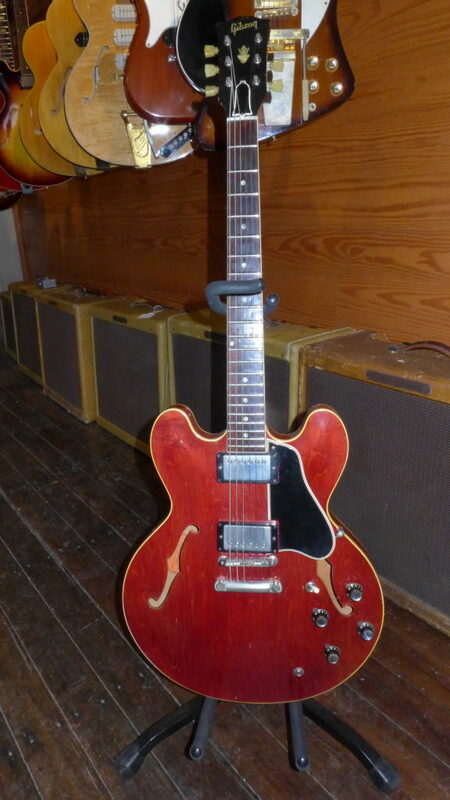 Very early 60 red dot neck. Nice, right? It’s got all the 59 features including the transitional neck but the factory order number is a little odd. Factory Order Number? What’s a factory order number? Red dot necks are not rare. They made 448 of them. 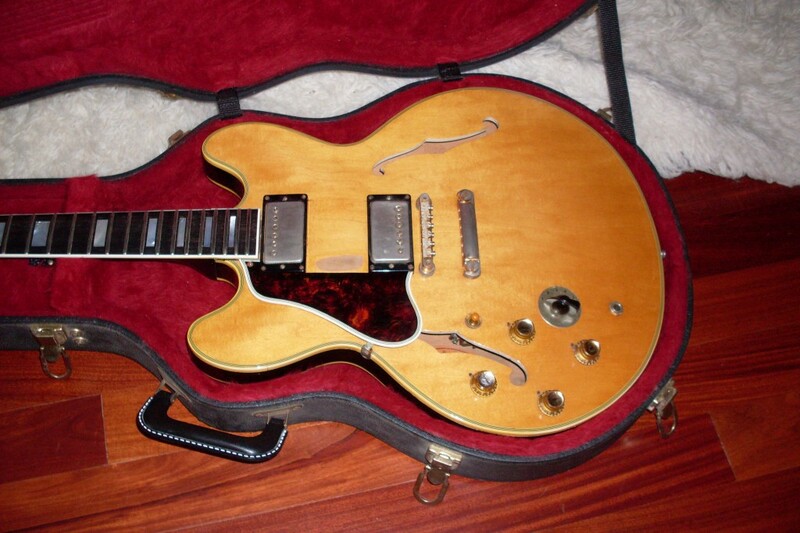 OK, that’s rare when you compare it to Stratocasters and other Fenders but for 335’s it’s not that rare. 1958 red dot necks are super rare. There’s one or at least one that is known. 1959’s are stupid rare, there are perhaps 6 (I’ve had two). 1960’s are less rare with 21 shipped but 60’s have to be looked at a little differently because changes were afoot during 1960 and they didn’t all happen on January 1. In fact, none of them did. They mostly happened around mid year. We’ll get to those after I totally confuse you with the concept of Factory Order Numbers (which I keep a database of). For those of you who aren’t complete geeks like I am, there is a number inside the body of a 58-61 ES-335 that isn’t the serial number. It goes on (supposedly), the day the assembly of the guitar begins. Assembly-not manufacture. The tops, necks and backs would have been made earlier than the FON indicates but when the folks at Gibson gathered the components together for a “rack” of guitars to be assembled, they stamped a number in there with a letter prefix to indicate what year they were built and what number the guitar is in the rack (usually 35 guitars, usually but not always of the same model). I’m only going to include 335 FON’s because the others make even less sense. The numbers are sequential-they start at 100 (although I’ve never seen one lower than 600) and they go to 9999 and then start over. “T” means 58, “S” means 59 and “R”means 60 and “Q” means 61 until they stopped using them at some point in 61. So, pay attention. This gets kind of convoluted. At the end of the years, there is some weird overlap. Theoretically, say the last FON of 58 was T7303 (which is the latest I’ve seen). So, the first rack of 59 should have been S7304 (which it isn’t). I had a 335 with the FON S7303 which is odd since 7303 is a T rack. Maybe someone forgot to change the year like they did on some Fender amps in 66. To make matters worse, there is a rack designated S6525 which shouldn’t exist as an S rack unless they went all the way through 9999 and back to 6525 which they didn’t. Unfortunately, it gets worse, not better. At the end of 59, the last 335 rack looks like S1765. It’s lower than the first S rack of the year because the numbers went through 9999 and started over in 59. But hold on, rack number 1762 is an R-the first R I’ve found. So is rack 1765 earlier or later than rack 1762? It should be earlier since the numbers are supposed to be sequential but it’s not an S (59) rack. Who cares, you ask? Well, me for one and here’s why. 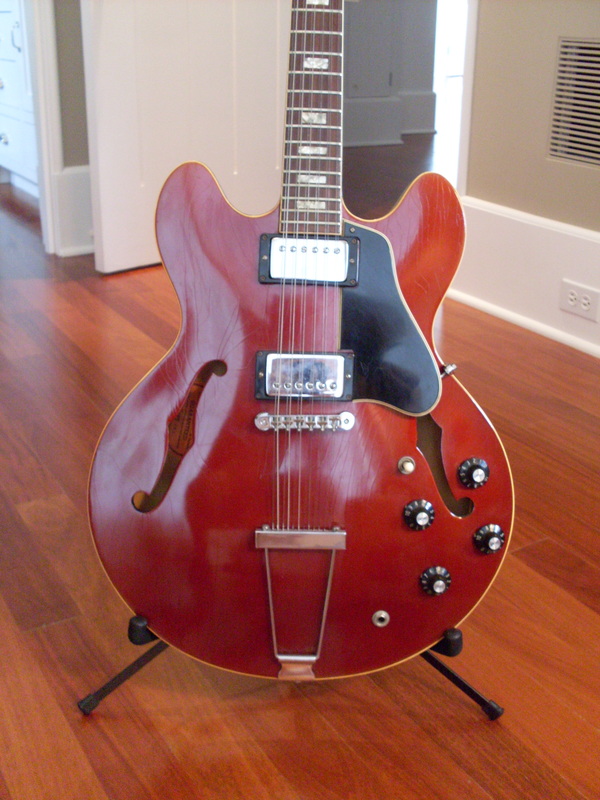 I recently bought one of those 21 red 335 dot necks from 1960 with all of the 59 features. Lucky me. 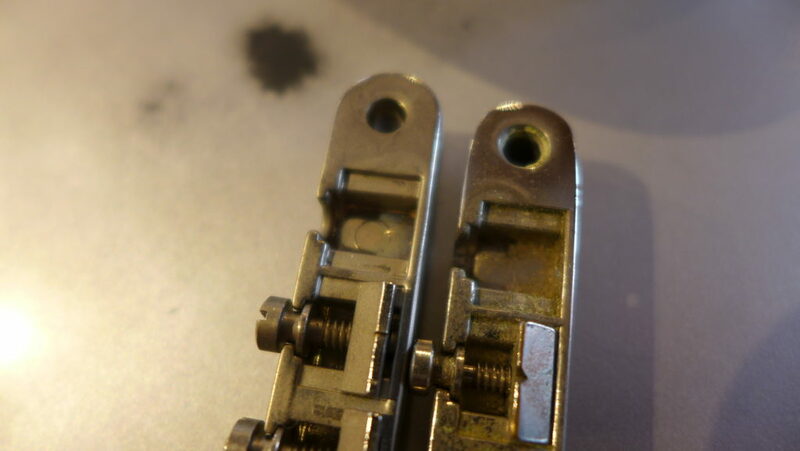 I was ready to bet that it was a 59 FON and a 60 serial-it’s a very early 60 and I’ve had another 60 like this one with a fairly close serial number to this one with a much earlier 59 FON. 60 335’s with 59 FONs are essentially 59’s that got shipped in 60-that’s why I care. This one isn’t quite that even though the guitar is totally identical. As I mentioned, the changes didn’t start on January 1, 1960. 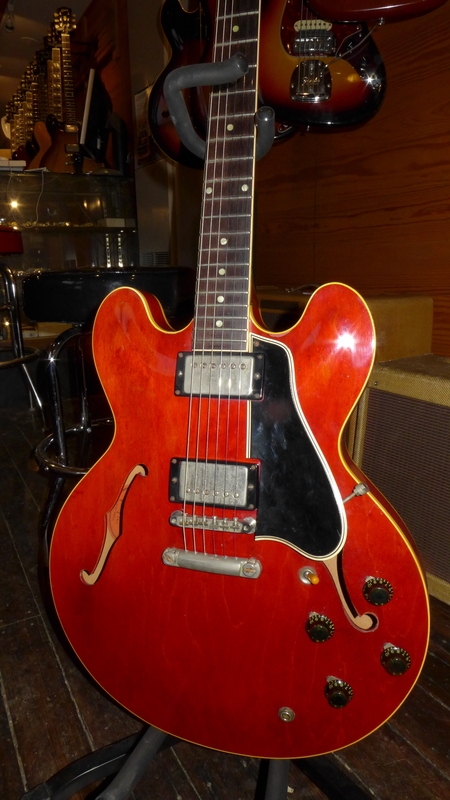 I’ve had a few other 60 red dots with later 60 FONs well into 1960, all with at least some 60 features like double ring tuners, smaller neck, reflector knobs and at least one with a short guard in late 60. So, I’m going to ignore the features and odd FON and call the guitar a 60 rather than what I usually designate as a 59/60. 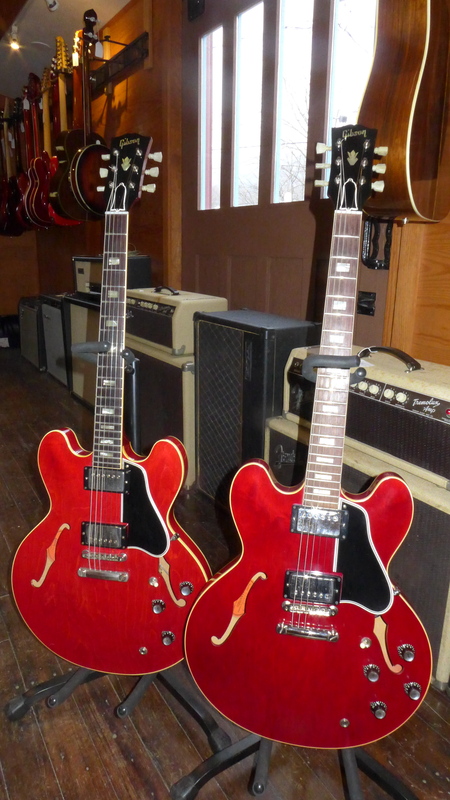 But make no mistake, if I put this guitar next to any 59 made after September or so, it’s identical. The last serial of 1959 is supposedly A32285. This 60 is A329xx. The last 60 red I had was A328xx and had a 3rd quarter 1959 FON. No wonder I’m confused. Here’s a later 60 FON. The letter is the year T for 58, S for 59, R for 60 and Q for 61 and then they stop. 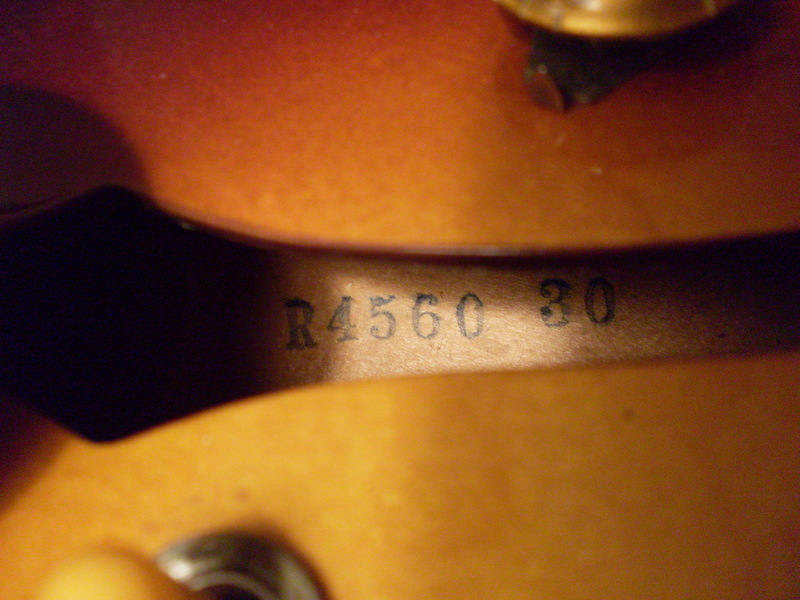 The number that follows is a three or four digit number and that designated the “rack”-usually 35 guitars. The last number is the “rank” or the guitars number within the rack. Confused?